Aerobic and anaerobic glycolysis are popular terms nowadays. They are fundamental in explaining how the body breaks down food and converts it into energy. One might also hear these terms mentioned by fitness buffs; aerobic and anaerobic exercise is important in improving one’s health and well-being. In scientific parlance, glycolysis involves ten steps during which monosaccharides such as galactose, fructose, and glucose are converted into intermediate substances in preparation for either aerobic or anaerobic glycolysis. The first type of glycolysis that was discovered is called the Embden-Meyerhof-Parnas pathway, or EMP pathway, and is considered to be the most common pathway utilized by organisms. There are also alternative pathways, such as the Entner-Doudoroff pathway. In layman’s terms, different organisms utilize aerobic and anaerobic glycolysis to convert food into energy. There are two major differences between these two types of processes. Glycolysis via aerobic glycolysis occurs when oxygen and hydrogen atoms bond together to break down glucose, and facilitate an exchange of energy. Anaerobic glycolysis, on the other hand, occurs when glucose is broken down without the presence of oxygen. Anaerobic glycolysis is utilized by muscles when oxygen becomes depleted during exercise, and the resulting lactic acid is later removed from muscle cells and sent to the liver which converts it back to glucose. The first difference between aerobic and anaerobic glycolysis has to do with the presence or absence of oxygen. If oxygen is involved, then the process is termed as aerobic; otherwise, without oxygen, the process becomes anaerobic. The second difference involves the by-products of each process. Aerobic glycolysis has carbon dioxide and water as by-products, while anaerobic glycolysis churns out by-products such as ethyl alcohol in plants, and lactic acid in animals; this is why anaerobic glycolysis is sometimes referred to as lactic acid formation. The human body can break down glucose in three ways during exercise. The first is via aerobic glycolysis, the second via the phosphocreatine system, and the third via anaerobic glycolysis. Aerobic glycolysis is utilized first in any activity, with the phosphocreatine system helping during activities lasting no longer than thirty seconds. Anaerobic glycolysis kicks in during activities that last a long time – it helps body muscles burn up energy. However, anaerobic exercise should not be utilized often since it can lead to the build-up of lactic acid in the body, an excess of which results in body cramps. Aerobic exercise is still the basic way to train the body to adapt to any kind of stress; it strengthens the body’s respiratory system, lessens blood pressure, and efficiently burns fat. Anaerobic exercise, on the other hand, helps build muscle mass and allows the body to burn an increased amount of calories, even while at rest. For best results, both aerobic and anaerobic exercises should be incorporated into fitness regimens to keep the body at maximum efficiency. Aerobic and anaerobic glycolysis are two ways by which organisms break down glucose and convert it into pyruvate. The aim of the glycolysis process is to convert food into energy. The first difference between aerobic and anaerobic glycolysis is the absence or presence of oxygen. If oxygen is present, the process is termed as aerobic, if it is absent, then the process is anaerobic. The second difference involves by-products of the process. Aerobic glycolysis has carbon dioxide and water as by-products, while anaerobic glycolysis has different by-products in plants in animals: ethyl alcohol in plants, and lactic acid in animals. The human body utilizes both aerobic and anaerobic glycolysis during exercise. A balance of aerobic and anaerobic exercise is needed to achieve ideal body fitness. Celine. 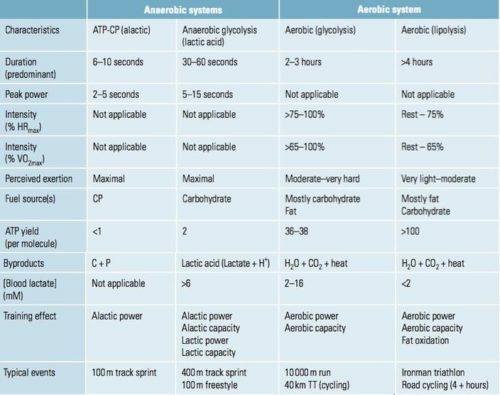 "Difference Between Aerobic and Anaerobic Glycolysis." DifferenceBetween.net. May 15, 2017 < http://www.differencebetween.net/science/health/difference-between-aerobic-and-anaerobic-glycolysis/ >. In the last paragraph, it says that the anaerobic glycolysis kicks in during activities that last a long time. I thought it was for a short duration like sprinting etc. By saying ‘short- time’, is it comparing the anaerobic glycolysis to the aerobic glycolysis?